For many, traveling to Africa to work with sharks is an exciting but daunting undertaking! Here we answer all questions that we commonly receive from prospective volunteers. How do our daily activities scheduled? On the program, we are flexible with our daily activities, and the Blue Wilderness team works out a daily program the night before. This works great, as it is difficult to predict how many clients we will be working with on a given day, or what the weather will be like. We try to work 5 days a week (which often covers weekends) with a couple of days break during the week. What will I, as a volunteer, get out of the program? 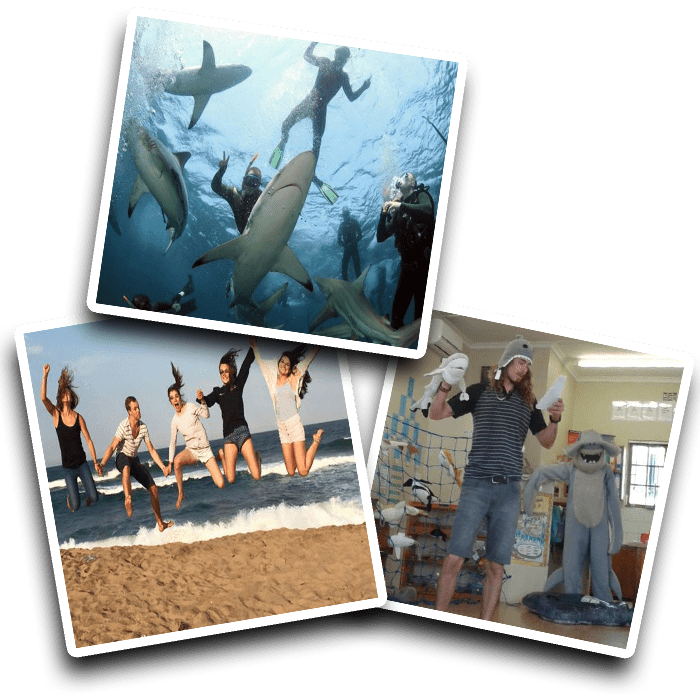 The primary purpose of the program is to offer you extensive real world training and experience in driving shark research, conservation, education and ecotourism operations and campaigns. We believe that shark ecotourism operations also have a duty to drive education, conservation and research initiatives. As such, our volunteers drive many of these programs. So in addition to becoming an expert shark diver, many of your experiences will empower you in the fields of shark education, research and conservation. Do I need a SCUBA certification to join the volunteer program? No – Many of our adventures are snorkel based, so you will be able to participate in all activities even if you cant SCUBA dive. But many of our students choose this as a time to get qualified with a SCUBA qualification. How much diving / snorkeling with sharks will we be doing? There is no set number, but the team will head to sea whenever we have clients or conducting a dedicated research trip. In total, you can expect between 15 and 20 trips to sea each month, during which you will either be snorkeling or SCUBA diving. Where do we stay whilst on the program? Blue Wilderness has a volunteer house near the beach of Scottburgh – South Africa, about 2 minutes away from the beach launch site. Scottburgh is located opposite the Aliwal Shoal Marine protected area. What does the volunteer fee not cover? Volunteers typically book onto the program for 1, 2 or 3 months. Longer time on the program requires a special visa to South Africa, and thus we limit participation to the three month period. Volunteers can come for a two week period if time is limited. This is your personal preference. There are many opportunities to collect footage and photographs of sharks and the marine life of Aliwal Shoal, and we welcome volunteers taking such images when work allows. SCUBA or snorkeling equipment is provided. Unless you have personal gear that is suitable for travel, e.g. a mask, it is not advised to bring personal SCUBA equipment. What are the arrival and pickup arrangments? Volunteers should arrive on the 1st of each month and plan to depart on the 30th of the month. We will ask you to submit your flight / travel plans and then arrange to pick you up and drop you off a the airport. You should plan to arrive at ‘King Shaka Airport – Durban’. You must arrange your air travel to and from ‘King Shake International Airport – Durban‘. Will I require a VISA to travel to South Africa? Do I need travel / medical insurance? To confirm your booking, you will be required to pay a $500 non-refundable deposit. The remainder of the payment is due one month before you arrive in country. You are welcome to change the dates of your program if space permits, but we do not refund deposits. Chat to one of our program specialists. We are available to email, skype or whatsapp at any time. Connect here – Connect with program specialist. The Blue Wilderness Research Unit is a subsidiary of Blue Wilderness. Our core purpose is to conduct original shark research, conservation and education programs at Aliwal Shoal, South Africa. We achieve these goals though collaborating with affiliated scientists and postgraduate students.